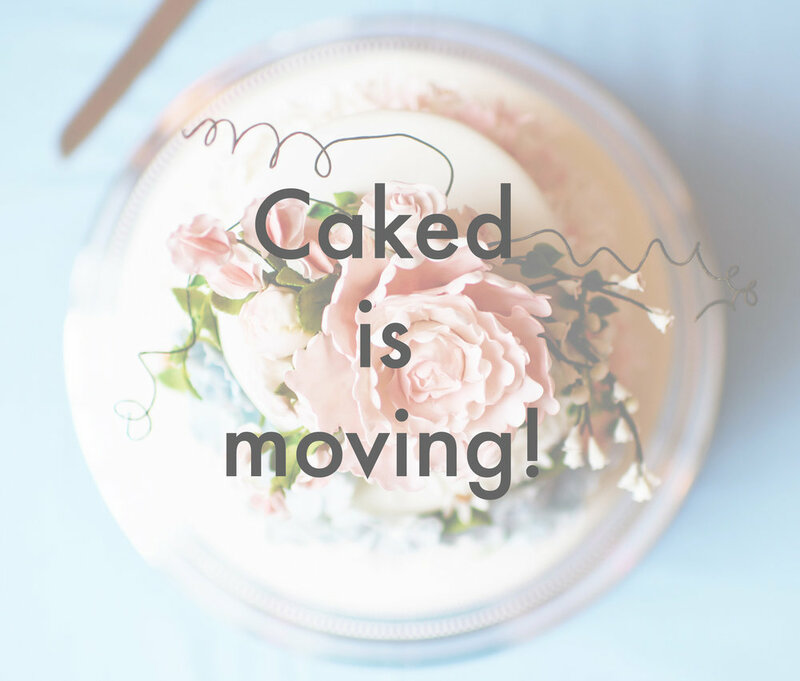 The latest news from Caked, including wedding cakes, celebration cakes and more. Dessert tables are becoming more and more popular, with couples choosing to offer their guests a sumptuous spread of desserts and treats alongside their cake, rather than a traditional table-served dessert. This can be a sumptuous display of desserts stretching as far as the eye can see, or simply some mini versions of your main cake or even cupcakes. You really can let your imagination run wild, and certain themes such as colours or flavours can be interweaved to create a gorgeous display. I created this decadent display of desserts for Mary & Mark last summer. 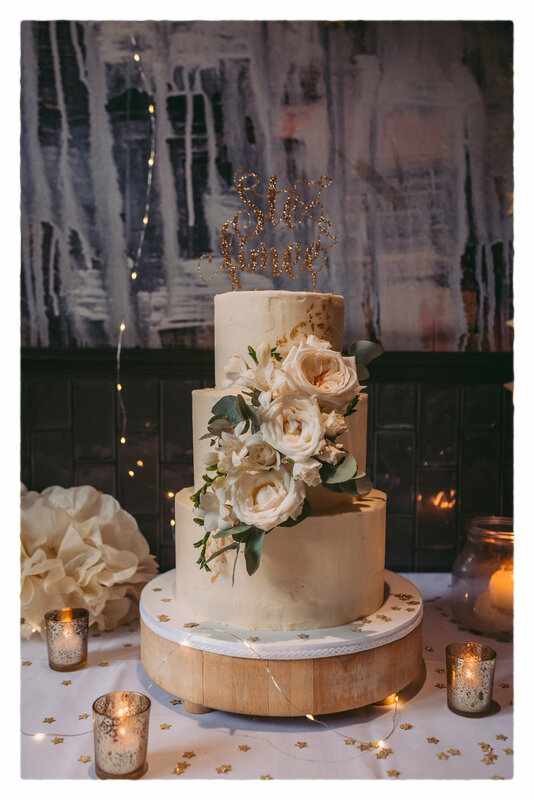 Alongside their show-stopping 4 tier wedding cake, they had brownies, mini cakes, cupcakes, cake pops, marshmallows, chocolate strawberries, sweets and decorated biscuits, all in romantic tones of pink, white and gold. Louise & Nick opted for smaller wedding cakes rather than one large one as part of a dessert table, along with a macaron tower and more. All of the individual cakes and treats incorporated their colour themes and leaf motifs. If you’d like to add fewer desserts to your cake table, smaller versions of your cake are a popular option. Serving a selection of mini cakes or cupcakes alongside your main cake creates interest and is a great way of adding portions. They’re also easy for guests to take home at the end of the evening, and children love them! Caked offers a fully bespoke service for all budgets, so if you’re interested in adding something a little different alongside your wedding cake, get in touch to start designing your truly individual dessert table. Contact Claire at Caked to book your consultation here. I’m thrilled to announce that Caked will be exhibiting at the Love That Wedding Show at Salisbury City Hall on Sunday 10th March! This is my first wedding show in the area and I’m excited to talk to couples about their wedding cakes, and meet all my lovely fellow suppliers. If you’re planning your big day come along for what I’m sure will be an amazing day! Caked has moved to Dorset! I’m pleased to announce that Caked has relocated to the beautiful West Country. For 3 years, Caked has been based in London and I’ve been lucky enough to work with so many beautiful venues such as Hedsor House, Kensington Roof Gardens and St Bart’s Brewery. I’ve also loved working with all the amazing wedding suppliers in the area. Now it’s time for a bit of a change, and I’m delighted to be relocating to Shaftesbury in North Dorset. I’m busy building my cake studio which will be ready for action in a few weeks, and I’ll be hosting wedding consultations there from end of March onwards. I can’t wait to show it off soon! I’m excited to explore my new area and meet new clients, suppliers and venues. I’m hoping to take full advantage of all the delicious local produce in the area, and integrate Caked into the local community. I’ll be delivering throughout the South West and further if needed (cakes travel surprisingly well! ), so if you’re planning a wedding or celebration soon, get in touch to enquire. I still have some dates free for this summer but don’t leave it too late - everything is handmade from scratch so I only take on a small number of orders per week. For couples who have already booked for this year and next, not to worry! Nothing will change for you and you will still have your beautiful delicious wedding cake. Interested in booking a consultation? Click here to contact Claire and start planning your dream wedding cake. In the meantime, I’m pleased to announce Caked has won Silver in the Bridebook Wedding Awards 2019! Thank you to Bridebook for their continued support, and be sure to check them out for all your wedding planning needs. Stay tuned for some big announcements in the next few weeks! Chances are, you're ordering a cake to celebrate something - perhaps it's your wedding day, a birthday or anniversary - and what better way to celebrate than with bubbles! Caked's Strawberry Prosecco flavour is everything you want from a celebratory cake. Light vanilla sponge soaked in a prosecco syrup and filled with prosecco buttercream and strawberry conserve. It's light, it's fun and a little bit cheeky! Click here for more information on booking your wedding cake with Caked. Whenever I include carrot cake in a consultation, without fail someone will say - "Ah my mother/grandmother/aunt used to make the best carrot cake"
And that's why we love it! Carrot cake is comforting, it's delicious, and it's a guaranteed crowd-pleaser. I offer my carrot cake with or without walnuts (my preference is with), and with or without raisins (my preference is without). Everyone has an opinion on these details! A white chocolate buttercream filling is the perfect accompaniment. Got a sudden craving for carrot cake? Click here to find out more about booking your wedding cake with Caked and to arrange a consultation (and eat some cake). It's a busy time in the Caked Kitchen! Wedding season hasn't officially started yet, but lots of couples are now at the stage of planning all the extras for their day, and most importantly their wedding cake. A consultation is a great opportunity to talk in detail about your wedding cake. We'll talk about all the aspects of your wedding - your flowers, your wedding breakfast, your schedule for the day - all the details that can affect the cake. You'll be able to flick through some magazines and my portfolio for inspiration. You can even bring along your invitations and dress swatches. I'll be able to advise how much cake is needed, where the cake should be displayed, and all the other details for your big day. All of this over a cup of tea and plenty of cake to taste. It's one of my favourite parts of cake designing! Together we'll come to a design you love. This may not be at your consultation, but I will keep designing until you have your dream wedding cake. Contact Caked to book your wedding consultation! Consultations are a complimentary part of your wedding cake booking - there is a £25 charge but this is deducted from your order at time of booking. Salted caramel as a flavour has been a buzz word of the food industry for a few years now. Unlike other trends that may have had their moment (I'm looking at you Cupcakes, Cronuts and Duffins! ), salted caramel has proved it is no passing gimmick. And there is good reason for that. It just works. Cake is sweet, and when you fill or top it with more sweetness from rich buttercream, it can be a little too much for some palates. But with a swirl of salted caramel drizzled on top, or a spoonful (or several!) whipped into buttercream, that saltiness cuts through all those sweet flavours perfectly. Which is why my Vanilla Salted Caramel is one of my most popular flavours. If you're more of a savoury person, or you're not keen on overly sweet flavours, this one is for you! At Caked, I use a homemade salted caramel to swirl into the buttercream, it's delicious! Caked is now fully booked until end of May 2018, but there are still limited dates available for June onwards. Contact Claire at Caked to book your wedding consultation and taste some of the featured Friday Flavours. Caked will back at the Chosen Wedding Fair this Spring! Come along on Sunday 25th March to meet some amazing wedding suppliers - Chosen Weddings hand-selects interesting and innovating suppliers, from photographers, stationers, make-up artists, and of course wedding cakes! Be sure to stop by Caked to see my latest designs and taste some delicious treats. The Chosen Wedding Fair will be at the Islington Assembly Hall from 11am - 4pm. Visit www.chosenwedding.com to book your tickets, tickets are just £4. I'm looking forward to seeing you there! This was one of the very first flavours on my cake menu, so it has a special place in my heart. Developed for the very first wedding cake I ever made, my good friends Matt & Ari had lavender as the main theme of their wedding. They specifically wanted lemon cake, but when I added the lavender twist, they were sold. Their buttercream wedding cake was decorated with crystallised lavender around each tier. With the floral twist, Lemon & Lavender is particularly popular for summer weddings. A super zesty lemon & lavender syrup soaks through the fluffy lemon sponge, with an equally zingy buttercream, it makes a perfectly light cake for serving after a large meal. As one of my signature flavours, Lemon & Lavender is included in most consultations. 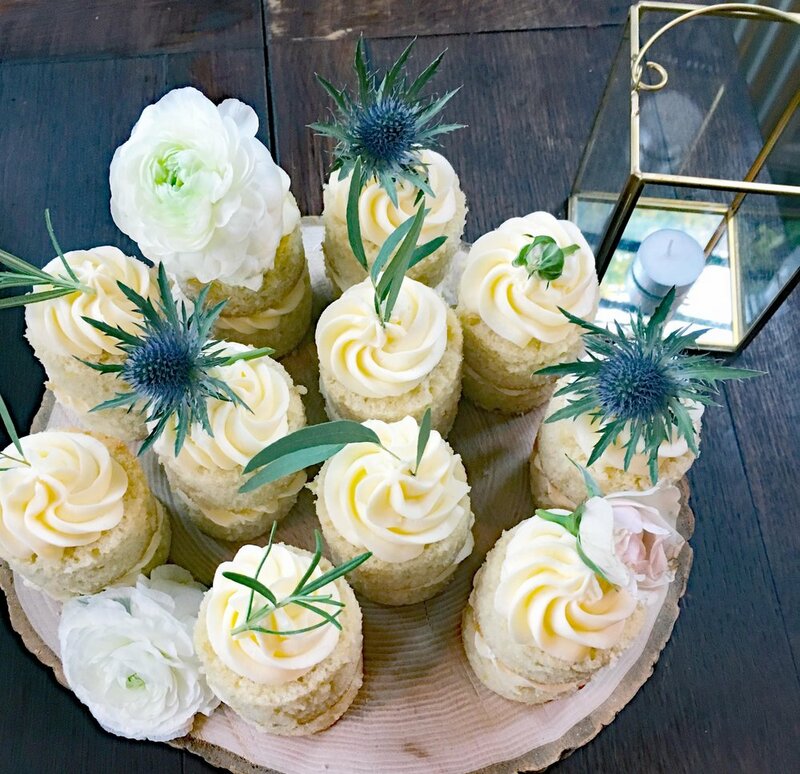 If you're keen to taste it for your wedding day, contact Claire at Caked to arrange your wedding consultation. Dates still available for Summer 2018! 2018 Wedding Cake Trends? Go With What You Love! The wedding industry is shaped around trends, and they are there for a reason. Essentially they are a round-up of what is popular at a given time. But when planning your wedding, I think it's so much more important to think about what YOU want. Don't worry about what all the wedding mags and blogs are telling you you should be doing. Pick the things you like and go with it. In fact, the biggest "trend" I've seen recently is a complete lack of theme. Couples seem to be picking what they want because they love it, rather than sticking to a particular colour scheme or look. That said, it is useful to know what is popular, even if it's just for inspiration. Rather than grandly announcing the 2018 wedding cake trends you "should" be following, I will simply share some elements of wedding cake design that I'm loving at the moment. I love metallics. Anything gold, copper, bronze, pewter. The shinier the better. I love natural-looking flowers (whether fresh or sugar). Wild, whimsical, traditional English country garden-style flowers trailing and wafting. I'm loving a bit of texture, particularly in the same colours. You'll be seeing a lot of white on white bas relief detail from me this year. I still love marbling, maybe with some brighter colours involved. And finally, I'm close to loving painted cakes - it's a work in progress! My final thought on 2018 wedding cake trends? Go with what you love and will make you happy on your big day! Contact Claire to arrange your wedding cake consultation. There are still dates for Summer 2018 available! This one's a must for any chocolate lover! Chocolate Oreo is another popular flavour for weddings. Layers of rich fudgy chocolate cake with white chocolate buttercream and crushed Oreos. If you're serving your cake as dessert (a great way to save some pennies and make sure everyone tries the cake! ), this is a great choice as it's a little richer than other flavours. It's almost more like a brownie than a cake! If you're keen to try this flavour and more, book a consultation for your wedding cake with Claire. Click here to get in touch. This is one of my all time favourite cakes, and it's fast becoming a favourite with Caked customers too! I created Spiced Apple & Chai when the lovely Rebecca & Nick asked me to create a bespoke flavour for their autumnal woodland wedding last October. After much experimentation with apples, blackberries, toffee and much more, they fell in love with the sweet and warming spiced apple. The light gently spiced apple sponge is soaked with a warming spiced syrup, and perfectly complimented with a fluffy chai buttercream. It's different, comforting but most importantly, absolutely delicious! Contact Claire at Caked to book your wedding cake consultation now! 2018 Summer dates are fast filling up so be sure to book soon! January is dragging on, so I think it's the perfect time to introduce a brand new flavour - St Clement's! This one packs a super citrussy punch, and would be a perfect choice when serving cake after dinner. With an orange and lemon almond sponge, soaked in a citrus syrup and accompanied by a yuzu buttercream, this cake will definitely get the tastebuds going. Get in touch if you fancy trying the new flavour, along with my best-selling flavours like Red Velvet and White Chocolate & Raspberry. Contact Claire at Caked to book your wedding cake consultation now! Each Friday I'll be showcasing one of my signature cake flavours, and introducing some new ones along the way. To start things off, I can't think of anything more fitting than one of my bestselling flavours - Red Velvet. I always find it difficult to describe the taste of Red Velvet. It's an oil-based cake, so not as rich as a cake made with butter. But there's a creaminess to it, a hint of chocolate, and for want of a better word, it's deliciously moist. No one quite knows the origin of Red Velvet, but it first appeared in America in the 1920's. Many claim to be the inventor of the cake - including the Waldorf Astoria in New York! - but it's generally thought to be a Southern-style cake. What is certain though is the clear resurgence in recent years, not just in America but worldwide. There are many different recipes, mine took over a year to perfect. I pair mine with white chocolate buttercream, an ideal companion especially for wedding cakes. So if you're looking for a show-stopping wedding cake, Red Velvet could be for you. 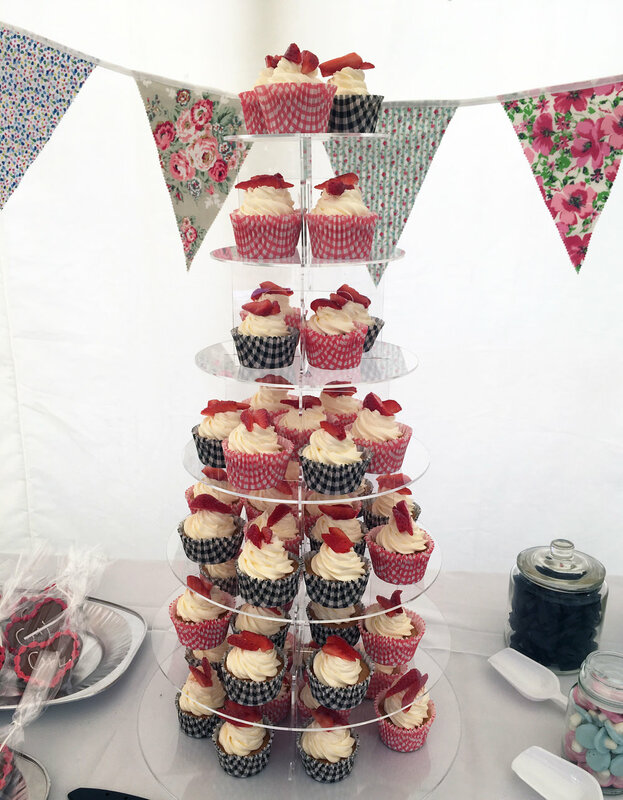 I include Red Velvet in all my consultations so if you're keen to try, book in your wedding consultation now! Click here to book your consultation with Claire and taste Red Velvet for yourself. Happy New Year from Caked! I love a wedding! I had the privilege of making wedding cakes for lots of beautiful couples this year, including a 7 tier showstopper and a Game of Thrones inspired cake complete with sugar dragon on top. Semi-naked cakes were super popular, a trend which looks set to continue for 2018. Here are just a few from this year. Next year I'll be at the Chosen Wedding Fair at Islington Town Hall in March, plus more to be confirmed. Stay tuned for more information! Any celebration needs a cake, and I'm always happy to help. From children's birthdays to anniversaries, a cake will add a sweet touch to any party. Here are some of my favourites from this year! I held my very first Caked workshop earlier this year to help raise money for Christians Against Poverty with the lovely Kathryn Thomas. Students learned to make chocolate truffles and decorate Easter biscuits. It was a great day! Next year is already looking busy for Caked, and I can't wait to get started! Thank you to all my wonderful clients this year. I feel extremely lucky to get to work with such lovely people and help them celebrate all the important moments in their lives. If you're getting married this year get in touch to talk about your wedding cake! Click here to arrange a consultation with Claire, or to ask about your next celebration. Last weekend I had the privilege of making a cake for a Game of Thrones inspired wedding. It was truly amazing! I met Steve & Julie this time last year, and we immediately clicked through our mutual love of the TV show. They began telling me all about their plans for their wedding and I started imagining all the amazing potential cakes in my head. They decided on a semi-naked cake decorated with fresh flowers and dragon eggs, and a sugar dragon on top! The sugar dragon (Drogon, of course!) was a delicate balance of ferocious and wedding-appropriate prettiness - I thought he was adorable anyway! Once his wings were in place, he provided the perfect show-stopping topper to their cake. Steve & Julie chose three flavours for their wedding cake - White Chocolate & Raspberry, Lemon & Lavender, and Chocolate Salted Caramel. They included just the right amount of Game of Thrones details in their big day. Bisham Abbey provided the perfect backdrop, complete with a towering Christmas tree. Tables were themed by Game of Thrones houses, banners adorned the walls, and the happy couple even cut the cake with swords. A stunning wedding! Congratulations to Steve and Julie! 2018 dates are already getting booked up quickly! To avoid disappointment contact Caked here to book your consultation. Last weekend I had the pleasure of making a beautiful autumnal woodland-themed wedding cake for the lovely Nick & Rebecca. They celebrated their wedding day at the atmospheric Grim's Dyke Hotel in North London, the perfect setting for their theme with its wooden panel interior and ancient woodland surrounds. Nick & Rebecca wanted their theme to carry through to their cake, and I loved playing around with the design to achieve this. They decided on a fondant-covered cake decorated with burlap ribbon, sugar roses, oak leaves, acorns and pine cones. I even convinced them to include gold-painted animal figurines (which I have since fallen in love with and would include on all future wedding cakes if I could!). The autumnal theme didn't stop with the decoration. Nick & Rebecca asked me to develop a bespoke autumn inspired flavour for the top tier. After some experimentation with apples, blackberries and salted caramel, they opted for a delicious spiced apple cake with chai buttercream (which has proved such a hit it is now a mainstay on my menu!). As well as the Spiced Apple & Chai, they had White Chocolate & Raspberry, and Chocolate Oreo. Finally, how cute were their wooden squirrel toppers (complete with sugar acorns nestled between them!)? Huge congratulations to the happy couple! Caked is taking bookings for 2018! To book your consultation with Claire click here. Don't leave it too late for summer dates! I love it when clients share photos of their wedding day with me! Ste & Aimee's wedding day was back in August, and I couldn't resist sharing their cake in all its glory. This was one of my favourite cakes of this year, and the moody backdrop of St Bart's Brewery in Farringdon added a whole new dimension. The flowers, the buttercream, the gold...such a gorgeous cake to work on. Their cake was made up of two tiers of white chocolate sponge with white chocolate & raspberry buttercream and one tier of chocolate mud cake with white chocolate & oreo crush buttercream. The stunning flowers were provided by Ladybird Flowers and the beautiful photographs were by Alexander Newton Photography, links at the bottom of this post. I was also excited to create a tower of doughnuts for Ste & Aimee, as the groom specifically loves them! The cake table and doughnuts were beautifully styled by the St Bart's Brewery team. Congratulations again to the happy couple! To book your wedding cake consultation click here to contact Claire and start planning your dream wedding cake. Caked will be exhibiting at the wonderful Chosen Wedding Fair at the Islington Assembly Hall in London this Sunday 8th October! I can't tell you how excited I am to be exhibiting at this fair, and to meet all the super talented suppliers who will be there alongside me. Chosen handpicks their suppliers and actively supports small businesses in the wedding industry. It really is a lovely group to be a part of. So come along for some truly unique ideas for your big day, and of course to taste some cake! I'll also be giving away iced biscuit wedding favours on the day while they last!